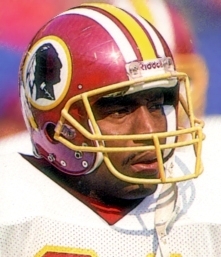 Two bitter NFC East rivals, the Dallas Cowboys and Washington Redskins, faced off at RFK Stadium on December 13, 1992. The Redskins, coached by Joe Gibbs for the twelfth season, were the defending NFL Champions but finding the going more difficult the year after winning the Super Bowl. Following a 5-2 start, they lost three of four games and were at 8-5. QB Mark Rypien was not performing up to his level of the season before and the vaunted offensive line was injury-riddled. However, 30-year-old RB Earnest Byner was still dependable, the receiving corps led by WR Gary Clark was a good one, and the defense remained tough. Dallas was the up-and-coming team under Head Coach Jimmy Johnson and came into Washington with an 11-2 record, including a win in the season-opening contest with the Redskins. The offense had a solid nucleus with QB Troy Aikman, RB Emmitt Smith, and WR Michael Irvin and the defense was outstanding. The Cowboys had been a Wild Card team in 1991 and were looking to top the NFC East for the first time since 1985. There were 56,437 enthusiastic fans in attendance on a cloudy and breezy day. 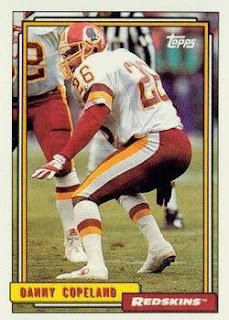 The teams traded punts to start the game before SS Kenneth Gant intercepted a Mark Rypien pass that was bobbled by TE Terry Orr at midfield and returned it to the Washington 42. The Cowboys advanced 37 yards in 10 plays, the biggest a throw from Troy Aikman to WR Alvin Harper for 21 yards. Emmitt Smith gained the necessary yardage to convert a fourth-and-one situation at the 10 yard line, but the Cowboys couldn’t reach the end zone and Lin Elliott kicked a 23-yard field goal. The teams returned to exchanging punts for the remainder of the opening period and into the second quarter. Taking possession at their own 47 after a Kelly Woodburn shanked punt traveled 30 yards and went out of bounds, the Cowboys drove 53 yards in six plays. 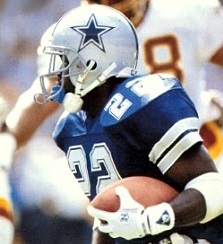 Facing third-and-nine, Aikman connected with Michael Irvin for 40 yards to the Washington 12 and then completed two passes to TE Jay Novacek, the second for five yards and a touchdown. Elliott added the extra point and the visitors were up by 10-0. The Redskins again had to punt following their next series, which saw the home crowd boo Rypien for twice missing makeable throws intended for Gary Clark, but got a break when WR Kelvin Martin slipped and muffed the kick and center Guy Bingham recovered for Washington at the Dallas 41. On the next play, RB Earnest Byner (pictured at left), faking a sweep to the right that successfully fooled the defense, threw an option pass to Orr for a 41-yard TD and, with Chip Lohmiller’s conversion, the Dallas lead was narrowed to 10-7. The Cowboys advanced into Washington territory on the next possession, helped along by Smith’s 17-yard run to the Redskins’ 41. However, following a short carry by Smith, Aikman threw three incomplete passes, the second of which was broken up in the end zone and the third nearly intercepted by LB Wilber Marshall. Dallas was forced to punt and pinned the Redskins inside their 20, which ultimately resulted in a 50-yard line-drive punt by Goodburn that Martin returned for 18 yards to the Washington 42. Taking over on offense with 2:06 remaining in the first half, it took seven plays for the Cowboys to score again. Aikman completed passes to Harper for 12 yards and Martin for nine, but a holding penalty backed Dallas up. However, a pass interference call on the Redskins gave the visitors a first down at the Washington 11 and, three plays later, it was Aikman to Novacek once again for a five-yard touchdown. Elliott added the point after and Dallas took a 17-7 lead into halftime. The Cowboys had the first possession in the third quarter and punted from midfield. Washington put together a 12-play, 68-yard series in response. Byner ran effectively and Rypien completed four passes, the longest to WR Ricky Sanders for 29 yards. But after finding themselves with first-and-goal at the one, the Redskins lost yardage and had to settle for a 32-yard Lohmiller field goal. Dallas was on the move as the game headed into the fourth quarter, helped along by a fake punt in which FB Daryl Johnston ran for 13 yards in a fourth-and-six situation to the Washington 38. Smith ran for 18 and 14 yards on the next two plays and the Cowboys had first-and-goal at the six. But following two more carries by Smith, Aikman passed on third down and LB Andre Collins intercepted and returned it 59 yards to the Dallas 42. Rypien had completions to Clark for 16 yards and Sanders for 13 as the Redskins drove to a 22-yard Lohmiller field goal. Instead of Dallas potentially scoring a game-clinching touchdown, Washington had now made it a four-point contest at 17-13. On the third play of the next Dallas series, Irvin fumbled when hit by CB Darrell Green after gaining 20 yards on a pass from Aikman. SS Danny Copeland recovered and returned it 15 yards to give the Redskins the ball at the Dallas 24. Rypien passed to Clark for 13 yards and Byner had a four-yard run, but the home team found itself facing fourth-and-one at the Dallas two and Rypien’s pass intended for Clark was overthrown. The clock was down to 3:33 to play as the Cowboys took possession. Johnston ran up the middle for two yards, but on second down Aikman fumbled while being sacked in the end zone by DE Jason Buck, who overwhelmed center Mark Stepnoski and got a hand on the ball just as the quarterback was about to go into his throwing motion (television replays were inconclusive as to whether Aikman had already begun to move his arm forward before losing the ball). Smith picked the loose ball up for Dallas, but he was hit by Collins and Copeland and tried to toss the ball out of the end zone. Copeland managed to recover for Washington for a touchdown, but the resolution of the play added to the bizarre situation as the safety had already left the pileup with ball in hand and run to midfield to celebrate while the officials were still sorting out who had possession, and he had to return to the end zone. Lohmiller converted and the Redskins were ahead by three points. There was still time for Dallas, and with the crowd in a frenzy, Aikman threw back-to-back 14-yard completions to Martin and Irvin. Another throw to Martin was good for 10 yards to the Washington 38, but Aikman was then sacked by Collins for a loss of seven yards. A toss to Smith regained the yardage, but on third-and-10, Aikman was sacked once again, this time by LB Monte Coleman. Aikman threw for Harper on fourth-and-17, the pass was incomplete, and Washington came away with a 20-17 win. The Cowboys had the edge in total yards (342 to 246) and first downs (22 to 14). However, the Redskins recorded four sacks, to two by Dallas, and the Cowboys turned the ball over four times, one leading directly to the winning touchdown, to one suffered by Washington. Mark Rypien had a mediocre performance as he completed 12 of 29 passes for 144 yards and gave up an interception. Earnest Byner rushed for 69 yards on 19 carries and also tossed a touchdown pass. Gary Clark caught four passes for 50 yards and Ricky Sanders gained 53 yards on his three receptions. For the Cowboys, Troy Aikman was successful on 23 of 35 throws for 245 yards and two TDs with one picked off. Emmitt Smith (pictured at right) gained 99 yards on 25 rushing attempts and caught five passes for 16 yards. Michael Irvin also had five pass receptions, for 105 yards, while Jay Novacek scored two TDs among his five catches for 25 yards. The loss proved to be the last of the season for Dallas. The Cowboys won their remaining two games to place first in the NFC East at 13-3 and continued on in the postseason to a Super Bowl triumph over Buffalo. The Redskins lost two close contests to finish out the schedule with a 9-7 record that placed third in the division but still qualified for the playoffs as a Wild Card. They defeated Minnesota in the Wild Card round but lost to the 49ers at the Divisional level. The decisive fumble recovery by Danny Copeland was one of three for the year and resulted in his only career touchdown. Earnest Byners touchdown pass was his only completion of the season, out of three attempts, and his third career scoring toss. He rushed for 998 yards on 262 carries (3.8 avg.) and caught 39 passes for another 338 yards (8.7 avg. ), compiling a total of seven TDs.